Former President Mahinda Rajapaksa in his misguided astrological and numerological wisdom held the seventh presidential elections on January 8th 2015. When the date was announced most people yearning for a regime change in Sri Lanka noted the symbolic significance of January 8th in a different context. It was on January 8th 2009 that Lasantha Manilal Wickrematunge , the well known editor of “The Sunday Leader” was brutally assassinated in broad daylight while on his way to work. Many of Lasantha’s family,friends,colleagues and readers had been consistently demanding that justice be done for the murdered editor but to no avail. It was an open secret then that the hands of Rajapaksa regime were stained with the blood of Lasantha Wickrematunge. So when the presidential poll was fixed for Jan 8th 2015 there was an optimistic feeling in these circles that the Rajapaksa regime would be overthrown on the date of Lasantha’s death. If that happened it would have been truly an instance of poetic justice,it was felt then. The unexpected happened and on Jan 8th 2015 Maithripala Sirisena obtaining votes cutting across race,religion, class and regional differences was elected president. There was buoyant optmism in Sri Lanka as Sirisena became president and Ranil Wickremesinghe Prime Minister. A “good governance” Govt was set up. A 100 day program was drawn up. The country basked in the glow of a gloriously radiant dawn. Alas!that dawn has proved to be a false dawn! There is disappointment on almost every front and the reasons are known to all. Disillusionment has set in. An important yardstick to measure the performance of the Sirisena-Wickremesinghe Govt is provided on Jan 8th. Even as the anniversary of President Sirisena’s electoral victory is celebrated on Jan 8th , the death anniversary of Lasantha Wickrematunge is also observed and mourned by those near and dear to the slain editor. An inevitable question arises on Jan 8th. Have the murderers of Lasantha Wickrematunge been charged in courts? The answer sadly is “NO”! 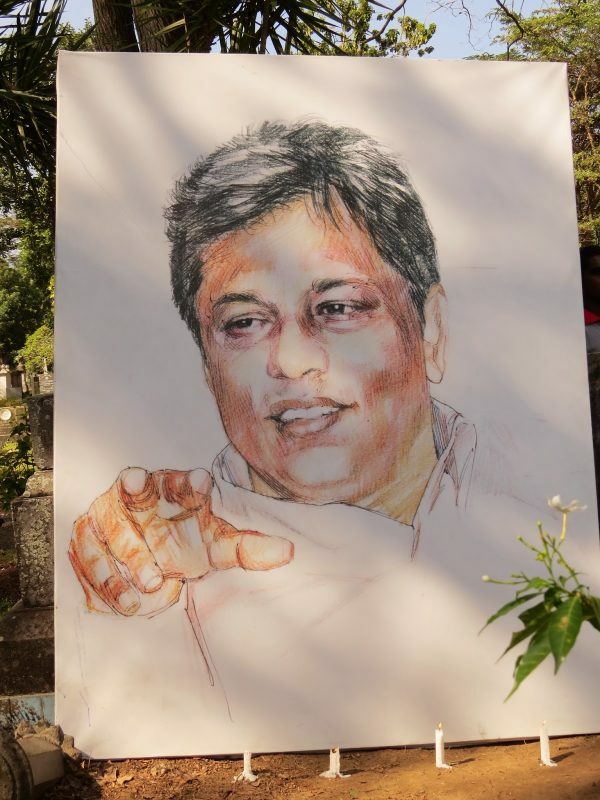 Nine years have passed since Lasantha’s death and three years have passed since Sirisena was elected president but no one has been charged in courts so far for Lasantha Wickrematunge’s murder. There have been many twists and turns in the process of investigations and some of those have been published in sections of the media. Sri Lanka’s politcal grapevine has been buzzing overtime with developments concerning Lasantha’s murder. Govt bigwigs talk positively of breakthroughs in probes and of potential indictments from time to time but the ground reality has been a NATO (no action talk only) so far. Lasantha Wickrematunge was murdered on January 8th 2009. On that fateful morning, a domestic aide had detected signs of potential danger. Some unknown men dressed in black on motor cycles were hovering around in the vicinity of Lasantha’s residence. The domestic aide warned Lasantha. When Sonali Samarasinghe, his wife heard about the hovering motorcyclists she pleaded with Lasantha not to go out of the house at that time. But Lasantha refused to do so and started out in his car to office asking Sonali to come later in her car. The motorcyclists had followed the vehicle and Lasantha had telephoned an “influential”person on his mobile phone and told him of the suspicious activity of the “motor cyclemen”.Lasantha’s car was on Attidiya rd near the “Bakery handiya” junction when the stalking assassins got into action. They converged around like predators encircling prey when the vehicle was close to the Malagalage junior school. According to some eye-witness accounts there were four motor cycles in all. Two had cut across in front of the car blocking Lasantha and forcing him to brake suddenly. Two other motor cycles moved up on either side of the car.The assassins in black wore helmets. Like the four horsemen of the apocalypse, these messengers of death closed in on Lasantha. The windscreen was smashed. The assassins then yanked the door open. Pulling out their instruments of death the “black” souls launched their cowardly attack against the unarmed journalist whose only weapon was his pen writing the bold truth. The assassins then mounted their bikes and sped away. There was a sentry point manned by the Air Force about 100 metres away. Several onlookers saw the terrifying assault. But the assassins simple vanished.The unconscious Lasantha was bleeding profusely. He was first taken to the nearest Kalubowila hospital. An ambulance was prepared to take him from Kalubowila to the National hospital. The doctors found his condition too critical to move him . So emergency surgery was done at Kalubowila with a team of doctors rushing to Kalubowila from Borella. The medical personnel strove hard for hours to resuscitate him. After four hours of battling for life Lasantha passed away.Thus ended the saga of one of the bravest human beings I have ever known. Thus ended the life of a fearless scribe, crusading for justice and peace. An irredeemable loss for journalism and Sri Lanka. Lasantha’s death has been a huge, personal loss to me.He and I were colleagues on “The Island” in the eighties of the last century. We were also residents of Kotahena then. Later on after I moved to Canada I was for many years a columnist writing from Toronto at “The Sunday Leader” which he edited.But “Lassie Boy” as I called him was a friend in every sense of the word. How I miss him! Lasantha Wickrematunge’s murder was not the only act of injustice that was perpetrated during the presidency of Mahinda Rajapaksa. Lasantha paid the supreme price but he was not the only victim from the fourth estate fraternity. Prageeth Eknaligoda was made to disappear;Poddala Jayantha was white-vanned and assaulted .Keith Noyahr was abducted and tortured.Upali Tennekoon and his wife were attacked. The plight of Tamil media personnel has been terrible. everal journalists have been reportedly killed in the past. Although a large number of journalists have been killed, made to disappear, assaulted and tortured in the past, the murder of Lasantha Wickrematunge has received the greatest attention on a national and international scale. 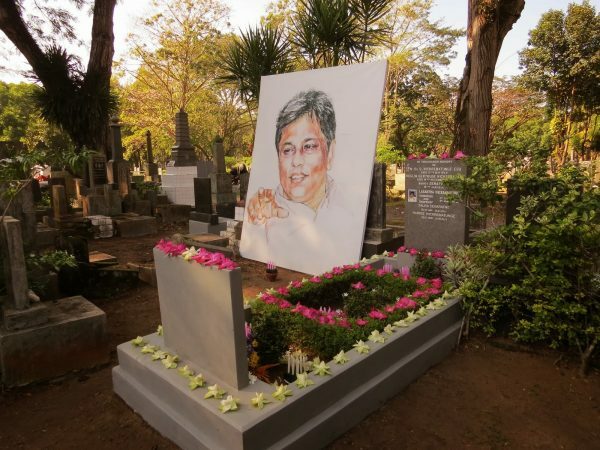 The main reason for this is that Lasantha Wickrematunge was the most high – profile journalist or Editor to be killed. He was a fearless editor who spoke truth to power and by doing so irked the powers that be.The brutal cold -blooded mode of his murder and the means adopted by the Rajapaksa regime to stifle and obstruct investigations indicated very clearly that Lasantha could not have been murdered without the sanction of those in power at that time. Hence the assassination of Lasantha Wickrematunge is regarded as an emblematic case symbolising the state of impunity in Sri Lanka. If there is justice for Lasantha then there could be justice for all. If there is no justice for Lasantha then there cant be justice for the others too. Lal Wickrematunge’s message contains two saient points of crucial importance. Firstly he says that many of the investigations into murders are all but concluded. “The need is to arrest the suspects and charge them for murder’observes Lal. Secondly Wickrematunge says “At present there is a sense of hopelessness at the manner the present administration is handling investigations” and goes on to ask ” Should political authorities be guiding murder investigations? If one were to take Lal Wickrematunge’s many layered statement at face value and also read between the lines, one inescapable conclusion could be arrived at about Lasantha’s killing. The investigation into Lasantha Wickrematuge’s murder and those responsible – both the minions and their masters – have been identified. The elephant in the room is the absence of political will at the highest levels of Govt to go ahead with appropriate legal course of action. This writer being a closely associated with Lasantha Wickrematunge in both a professional and personal capacity for many years has been following the process of investigations into the slain editor’s murder since his demise. The situation in the Rajapaksa era was that of constricting,diverting or obstructing the investigation. The motions were seemingly followed but there was no intention from inception to conduct a genuine probe. There were many red herrings. The situation under the Sirisena – Wickremesinghe Govt is somewhat different. There has been a genuine investigation, despite fits and starts , into Lasantha’s murder. The investigating sleuths seem to have garnered necessary evidence and identified the perpetrators but the obstacle appears to be foot dragging by those in the upper echelons of political power.Under the Rajapaksa regime it was a case of red light for the probe. Under this govt the green light was given for a free and fair investigation. Much of that probe is now over. However the law enforcement authorities are unable to proceed further to indict and prosecute because the amber light is flashing.The officials are in a quandary because they do not know what decision would be taken by the political executive. The ambivalent attitude of this “divided at the top” Govt is such that one does not know whether amber would turn to green or red! From what has been reported in the media so far and from what I have been able to gather through my own sources the current situation and background in brief seems to be this. The war against the Liberation Tigers of Tamil Eelam(LTTE)was pursued with renewed vigour after Mahinda Rajapaksa was elected president in November 2005. Mahinda appointed his brother Gotabhaya as Defence secretary. Acting upon the advice of his brother the defence secretary,President Rajapaksa appointed Sarath Fonseka as Army commander. The triumvirate comprising President Mahinda Rajapaksa, Defence Secretary Gotabaya Rajapaksa and Army Chief Sarath Fonseka was hailed for providing political, administrative and military leadership respectively in the triumphant war against the Tigers. The Rajapaksa govt resorted to several “unorthodox” measures in prosecuting the war. Officially sanctioned “unofficial executions”of those perceived as enemies of the state and those portrayed as threats to national security were allegedly committed. Many were killed in cold blood or white vanned. It soon came to a point when dissidents or those expressing contrary views were also depicte as enemies,threats and traitors. The media was controlled or managed through a carrot and stick method. While one set of media personnel were given computers as carrots, another group of more independent journalists were administered the stick in small,medium and large doses. Dealing with national security threats in the media was deemed necessary. A special unit was set up for this purpose specifically in late 2007 or early 2008. This squad consisted of specially selected operatives from the army and naval intelligence along with some underworld gangsters to provide a facade if and when necessary. This unit operated out of the re-furbished Manning Market premises. The special unit was structurally semi-official and functionally autonomous. The unit was commanded by an officer who was subsequently promoted to the rank of Major. This unit commanding officer was not answerable to the Army commander or Military Intelligence chief. He reported to and took directives only from a single authority ensconced in the upper echelons of the defence establishment. The rationale for setting up such a unit was to suppress or prevent any criticism of the manner in which the war was being conducted or the personal conduct of the top brass of the armed forces. This was deemed necessary because it was important to ensure that the armed forces were not de-moralized in any way. The special unit would “deal” with the media while the armed forces could continue their fight against the LTTE. What happened as is usual in situations like this was that the thin line separating real and imaginary threats got blurred. Persons perceived as being critical of the regime or those offering constructive criticism were also regarded and treated as enemies and traitors. It was against this backdrop that this unit performed sordid tasks such as abductions, assaults, white vanning and attacks on media personnel. The most heinous crimes committed against journalists were arguably the killing of Lasantha and disappearance of Prageeth. The unfettered investigations conducted by the Police Criminal Investigation Department(CID) after the current govt assumed ofice has resulted in a breakthrough in the probe into Lasantha’s killing. Telephone records have been meticulously delved into and many crucial calls traced. Even the telephone number from which the call was purportedly made “ordering” to give the works to Lasantha has been traced. The unit’s commanding officer and most operatives have been identified. All the murderers involved in the assassination of Lasantha Wickrematunge have been identified. Vehicles used for attacks have been seized and the houses used as torture chambers have been located.Some of those involved in the assassination including a high ranking officer were produced in court and later released on bail. According to media reports , several persons in the top rungs of the defence establishment including former defence secretary Gotabhaya Rajapaksa and Ex- Army chief Sarath Fonseka have been allegedly questioned. Files have been sent to the Attorney – General’s Department it is learnt. It appears from all accounts that there is enough evidence for a Prima Facie case in the murder of Lasantha Wickrematunge. But matters have not procceeded to the stage of indictment and prosecution due to the lack of political will. The Sirisena-Wickremesinghe regime calls itself a “unity” govt but the reality is that of strong disunity both at the top as well as the rank and file. The recent Treasury bond scam carnival as well as President Sirisena’s threats of swordplay have proved the existence of a great divide beyond doubt. Hence most issues are approached divisively.Confusion is compounded. This bi-furcated approach often working at cross purposes seems to be the root cause of perceived lethargy on the question of Wickrematunge’s murder. One school of thought opines that President Sirisena is allegedly responsible for the “delay” as he does not want members of the armed forces to be prosecuted at this point of time. Moreover there is speculation that President Sirisena enjoys a special relationship with ex defence secretary Gotabhaya Rajapaksa. It is also a blatant fact that Maithripala strove shamelessly to strike up a deal with the Mahinda faction for the local authority polls. The possibility of a Mahinda-Maithripala rapprochement after polls is not entirely ruled out by political analysts. The United National Party(UNP) on the other hand faces an embarassing difficulty. The UNP including Ranil Wickremesinghe blamed former Army commander Sarath Fonseka for Lasantha’s killing at that time. Some UNP stalwarts went on record that a unit under Fonseka’s supervision was responsible for the attacks on media personnel. One does not know whether the UNP allegations against Fonseka were correct or incorrect or partly correct. But the fact remains that Sarath Fonseka is today a cabinet minister of this UNP led government and is the UNP organizer for Kelaniya. So where does the UNP stand on the allegations levelled by that party against Sarath Fonseka over the killing of Lasantha Wickrematunge ?. Apart from the Fonny factor there is also a viewpoint that the UNP is soft pedalling the issue in order to weaken the divided SLFP further. One does not know whether the theories and hypotheses being propounded are right or wrong, but the fact remains that no tangible progress by way of indictment and prosecution has been made. Nine years have passed since Lasantha Wickrematunge was assassinated on January 8th. Three years have passed since Maithripala Sirisena was elected president on January 8th. The killers of Lasantha Wickrematunge are yet to be brought to justice. As stated before lasantha’s killing is an emblematic case of tremendous significance. Until and unless this Govt secures justice for Lasantha Wickrematunge , this Govt will remain in the dock at the court of public opinion both nationally and internationally. President Sirisena who is learning the intricacies of swordsmanship has been silent about Lasantha Wickrematunge on January 8th. Perhaps more important matters like obtaining a one year extension of his term of office may have occupied the presidential mind.Prime minister Ranil Wickremesinghe and Media minister Mangala Samaraweera who both interacted closely with Lasantha, have chosen to issue statements. The prime minister’s statement was in general about the third anniversary of President Sirisena’s election on Jan 8th with particular references to the slaying of Wickrematunge. “Despite these and whatever obstacles come before us, this Government is committed to providing the CID and the Attorney General’s Department with whatever resources and support they require to indict and convict those who committed, aided and instigated Lasantha’s murder. Failure is unacceptable. This is a debt of honour that we owe not just to Lasantha and his family, but also to the citizens of Sri Lanka, who have been deprived of one of the foremost champions of their democracy”. “Today, I call upon all media institutions, the legal fraternity, private sector and civil society organisations, once again to unite with us in rendering all possible aid to the police in this investigation, by seeking out and volunteering relevant information, identifying and safeguarding possible witnesses and responding to any requests promptly and thoroughly. Only by the conviction in a court of law of those responsible for this insoluble bloodstain in our national history can we honour Lasantha’s sacrifice”. So Prime minister Ranil Wickremesinghe assures us that President Sirisena and he remain committed to the vow of making Lasantha’s killers face justice. Media minister Mangala Samaraweera has reiterated that ” this Government is committed to providing the CID and the Attorney General’s Department with whatever resources and support they require to indict and convict those who committed, aided and instigated Lasantha’s murder”. He further says “Failure is unacceptable”. Fighting words indeed from the Prime minister and Media minister. Too much time has been spent in talk without any action. It is time for the Sirisena-Wickremesinghe Govt in general and the United National Party to stop ‘talking the talk’ and instead start ‘walking the walk’ The NATO syndrome of “no action talk only” must be abandoned. Meaningful constructive action must be taken to bring to book the assassins of Lasantha Wickrematunge. Both the arrows as well as the archers. Lasantha Manilal Wickrematunge’s 60th Birth day falls on April 5th. It is to be hoped that his killers would have been indicted by that date.